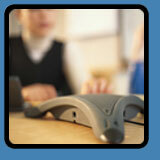 Audio conferencing is the most popular of our many products. New refinements and features continue to keep our audio conferencing services on the cutting edge. "MyConferenceSM" provides each host with his own 800 and/or local conference call number, eliminating the need to make a reservation. This service is available 24 hours a day, 7 days a week, 365 days a year.